I am SO picky with scents. I haven’t bought an actual full size perfume in years because I use it for a few weeks then can’t stand the smell anymore. I usually just get a sample made from Sephora (they will give you samples of anything!) or order sample sizes as my gift of choice when I check out. 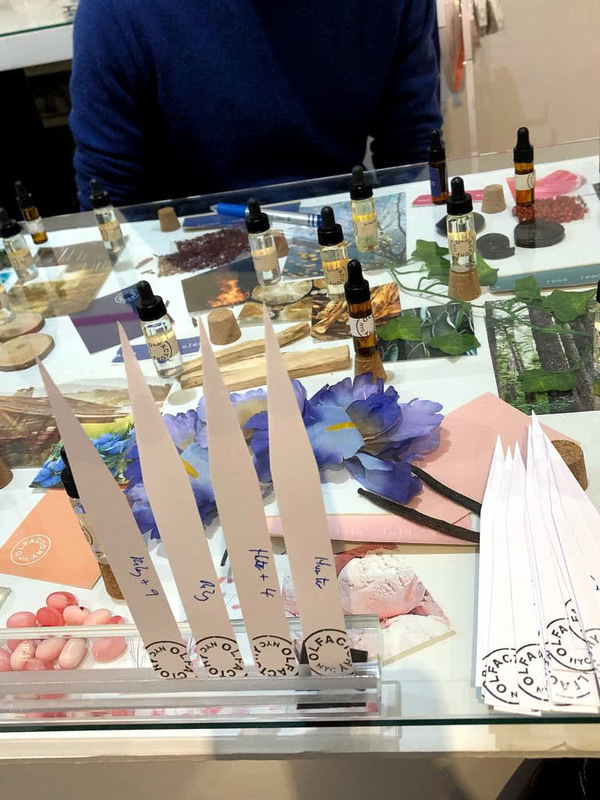 I was in New York earlier this month and heard about a place where you can create your own custom scent. It’s called Olfactory, rightfully so, and I had to put them to the test. 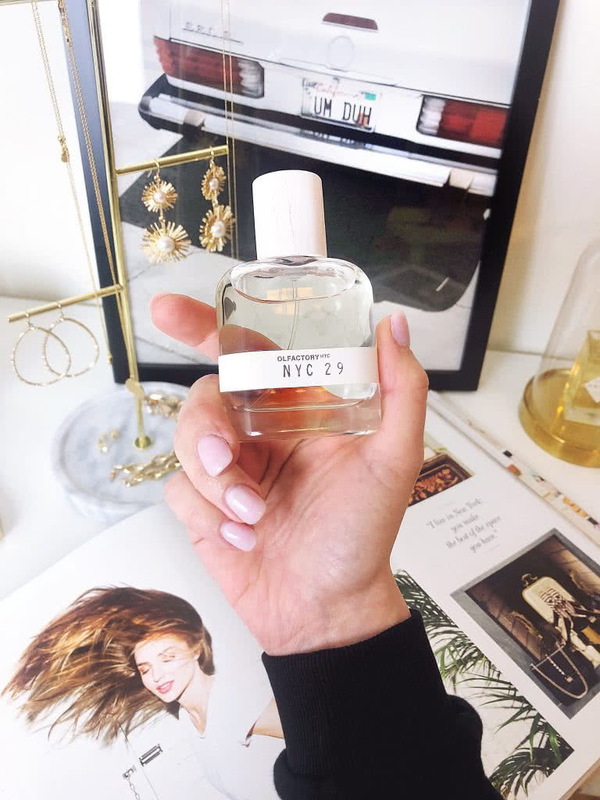 Could I actually find a perfume that I absolutely love (and can wear longer than 1 week)? 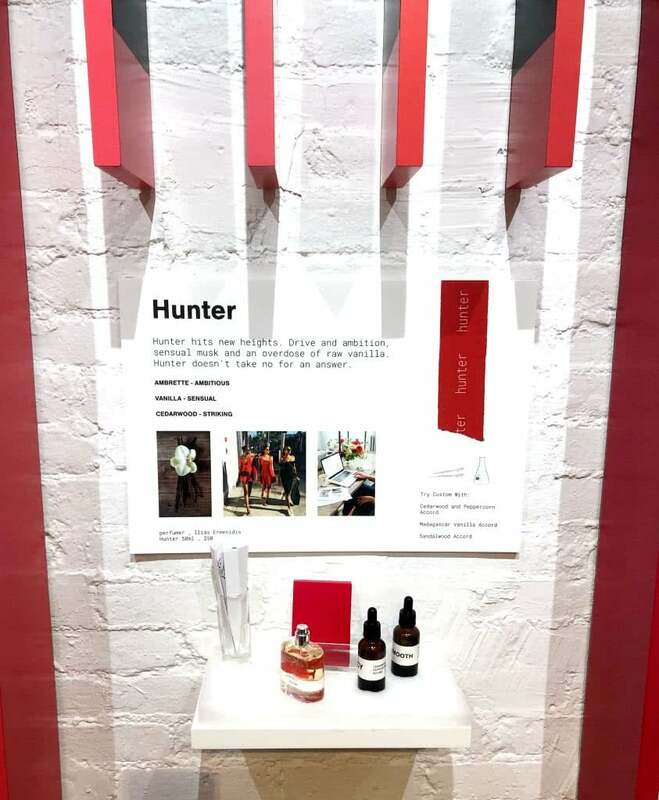 Their scents are curated by the world’s top perfumers from Gucci, Valentino, YSL, Tom Ford, Le Labo and more! 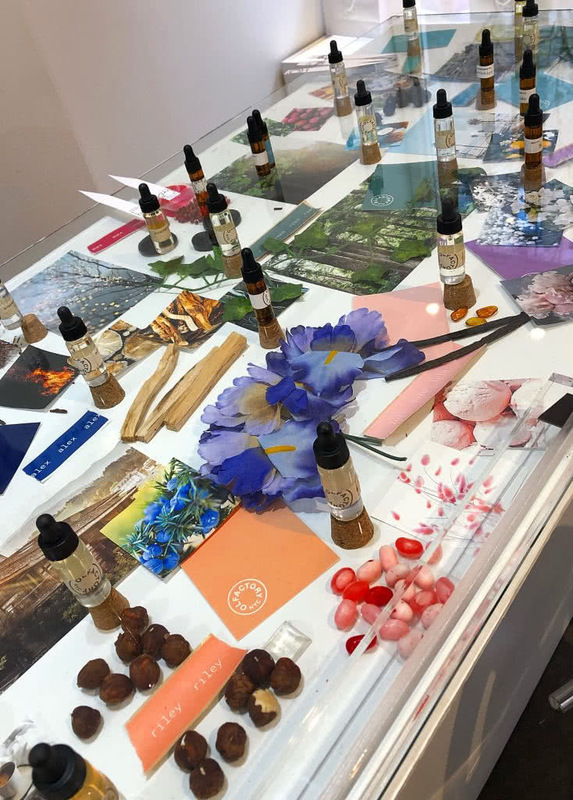 Their goal is to provide perfume that is a fraction of the price compared to the major designer fragrances, without compromising on quality- they use high quality, natural, and sustainable ingredients. First, you smell the original 9 scents – they call these the “Signature or Core Fragrances”. Then you narrow it down to 1-2. I actually couldn’t decide so I started with 3 core fragrances. I love how they gave me time and freedom to wander around and really smell every scent. This process took me about 20 minutes, but they said some people take hours! *Pro Tip- smell your skin to neutralize your nose between sniffing scents. After you pick your favorites you are brought to their scent table that has 14 different accords (add on scents). They get very specific- not just jasmine but french or indian jasmine mixed with lily of the valley and freesia or cedarwood. Thank god they have someone there to guide you through the process! 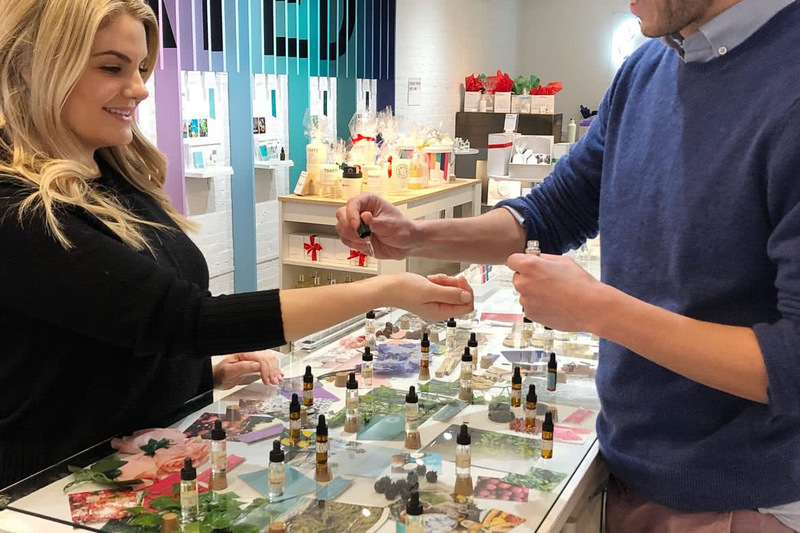 I worked with JJ- one of the founders and he instantly got an idea of what types of scents I liked and added some of the accords for me to smell. He didn’t get impatient or offended when I didn’t like one and I never felt pressured or like I was wasting his time. 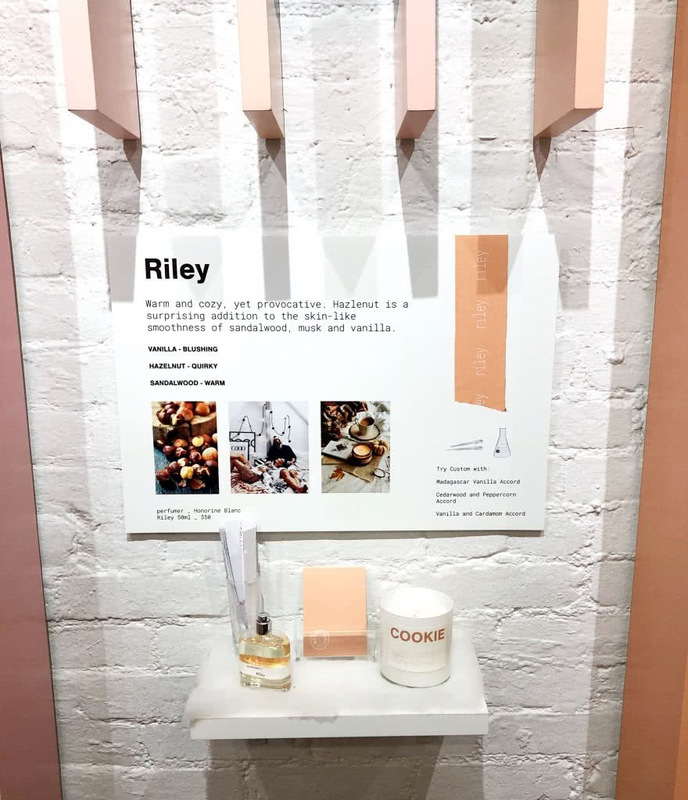 For my custom fragrance, I ended up choosing Riley with fresh cedarwood and incense. I would never have even smelled a fragrance that claimed either of those accords, but I actually LOVE this scent and I wear it every day! I’ve received so many compliemtnts on it AND Steve LOVES it!!! 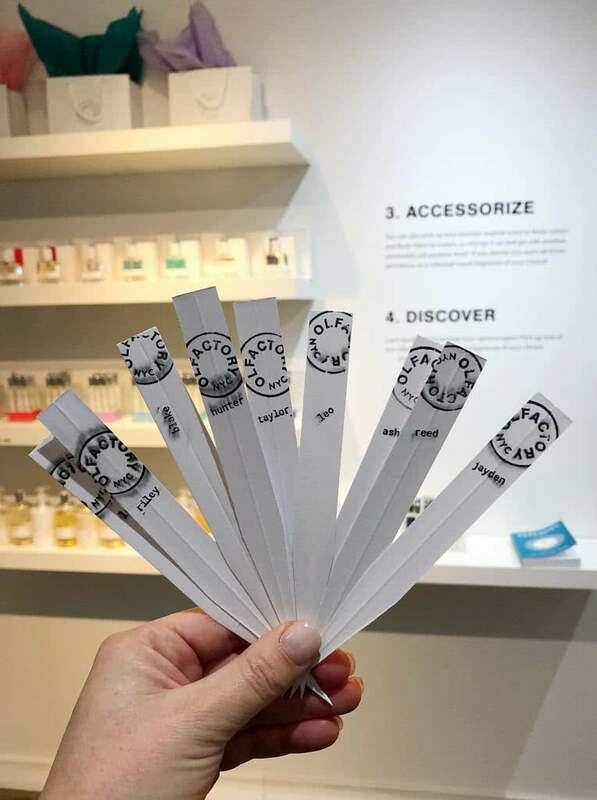 After you choose your custom scent you pick what color label you want, and the name. I named mine NYC 29 because I picked this one in NYC (duh) and the number 29 has a lot of special meaning to me. I also loved the core scents Riley and Hunter so I got mini bottles of each! They have a few options, first you can go into the store. But even if you don’t have a NYC trip planned anytime soon, you can order online! They have core scents youcan order in a sample set and narrow it down from there. You can also buy my custom scent all for yourself! It is on their website AND you can get 20% off by using the code Lauren20. Overall I am so impressed- I love supporting small businesses and this one is so innovative and unique. It really is a must see if you go to New York and hopefully they open more locations soon so everyone can experience this amazing process! What’s your favorite perfume? Are you picky like me? I want to try this out! I’m pretty picky when it comes to scents.